Bad breath in pets, particularly dogs, is often joked about, but it is not a laughing matter. Dental disease affects up to 80% of pets over the age of three, and just like humans, there can be serious consequences of poor dental health. Dogs start out with 28 deciduous (baby) teeth, cats start out with 26 deciduous teeth. By six months of age, these baby teeth fall out and are replaced by permanent teeth, 42 in the dog and 30 in the cat. Will I find the baby teeth, and what happens when they don't fall out on their own? You may or may not find the teeth as they fall out. As dogs play and chew on toys, you might see a tooth. Likewise, as a cat grooms, you may find a tooth in the fur. If the deciduous teeth don't fall out and the permanent teeth erupt under them, this can lead to problems, such as increased tartar formation, malocclusion problems, and gingival (gum) irritation. These retained teeth are usually removed at the time of spay or neuter uneventfully. The earlier the better. With the help of your Veterinarian, be on the lookout for retained deciduous teeth and malocclusion (bad bite) problems. 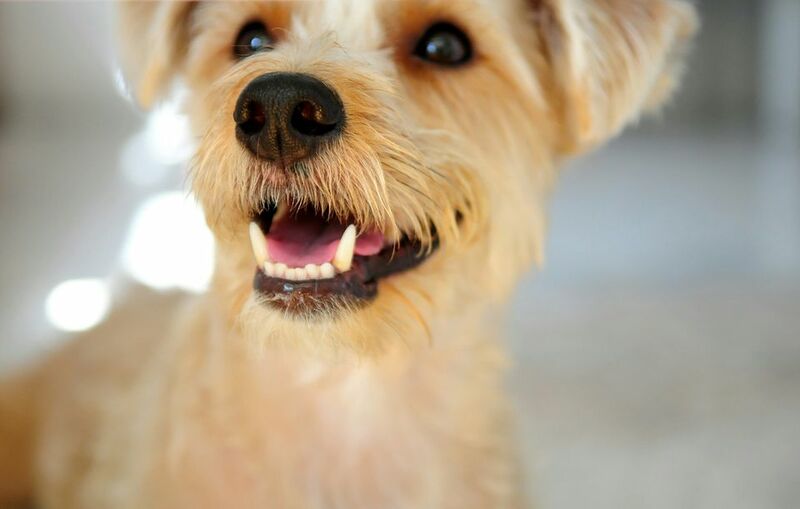 Your Veterinarian can teach you how to care for your pet's teeth and gums early on. Bad breath is often the first indicator of dental disease. Gently lift the lips and check for tartar, inflamed gums, or missing/broken teeth. Cats may exhibit increased drooling. Both cats and dogs can exhibit reluctance to eat or play with toys, "chattering" of the teeth when trying to eat, lethargy, bleeding gums, eroded teeth, and failing to groom (cats). The dental disease progresses in stages -- if caught early, you can prevent further damage and save as many teeth as possible. If your pet is an adult over 3 years of age, it would be wise to schedule a dental check-up with your veterinarian. If a dental cleaning is necessary, it is advisable to do pre-anesthesia blood work to make sure your pet does not have any underlying problems. As mentioned above, pre-dental bloodwork is recommended. This is a check on the overall health of the pet to make sure that liver, kidneys, and blood counts are within normal ranges and to reduce any risks possible prior to the anesthesia. Many pets with bad teeth will be put on an antibiotic a few days prior to the dental to calm the infection and reduce the possibility of complications. Your pet will be fasted from the evening before for the anesthesia. The dental itself is similar to a human dental cleaning - tartar removal, checking for cavities, gingival (gum) pockets, removal of loose or fractured teeth, any growths on the gums or palate, removal of diseased teeth, and finally, polishing. The polishing is to smooth the tooth after tartar removal, as the tartar pits the tooth. A smooth tooth will not encourage tartar formation as easily as a roughened tooth.